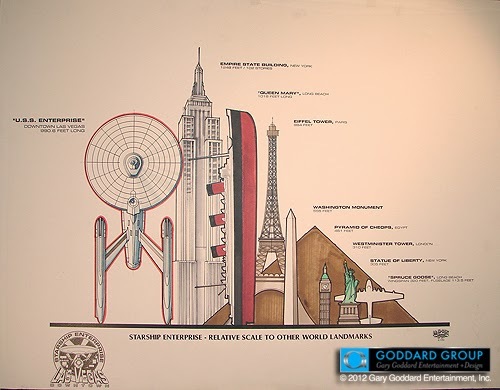 STAR TREK: That time they almost put a full scale USS Enterprise in Las Vegas! | Warped Factor - Words in the Key of Geek. STAR TREK: That time they almost put a full scale USS Enterprise in Las Vegas! 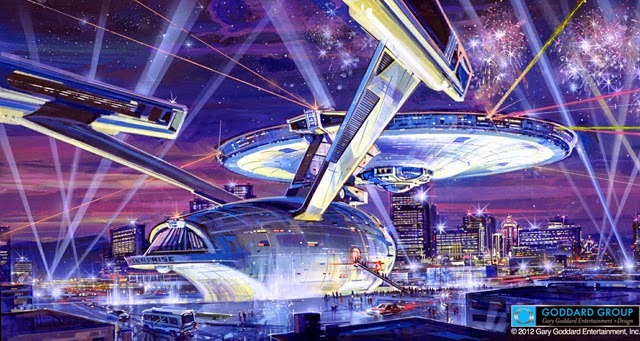 Wil looks back at the proposed early 1990s project that nearly saw a full scale USS Enterprise built in the centre of Las Vegas, Nevada. In 1992 a Las Vegas downtown redevelopment project was nearly won by the Goddard Group. Their plan was to build a full-scale Star Trek USS Enterprise - complete with restaurant, rides, tours and live entertainment. 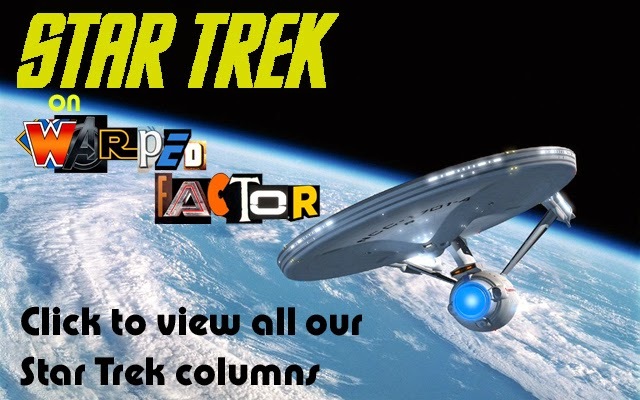 The aim was to attract fans of the show and tourists to the area to, at the very least, have their picture taken with the iconic Starfleet craft. The hope was that these visitors would then go on to spend money in the hotels and casinos located in the downtown region, which was suffering from the ever popular Las Vegas Strip. "My concept was to do something so large and so epic, it would fire the imaginations of people around the world. After looking at how difficult it would be to bring people to the downtown core (from the Strip), I knew we had to have something really exciting, dynamic, and without equal." I think a full size Starship Enterprise would do that! The project was set to cost $150 million, which is actually quite a bargain if you consider the scale of this kind of thing, and the sums of money spent on developing many of the other Vegas attractions. The financing would come from the local hotels and casinos, hence why the proposed Enterprise contained neither. In his quest to make "the world's largest destination attraction", Goddard learnt all there was to know about the Enterprise, and bought several of the world's finest engineers into the project to work out exactly how the spaceship would sit safely in a 'dry dock'. There would have to be some additional supports for the Saucer Section, but otherwise it would've looked just like the Enterprise we all know and love. Of course the project had to be cleared by many people. The then President of Paramount Studios, Sherry Lansing was on board, they also had the approval of the Paramount Licensing Group, and although they were not the only project in contention for the downtown redevelopment project, Goddard was called to a private meeting and told that 'The Starship Enterprise' was the favoured bid by the redevelopment committee and Las Vegas mayor Jan Jones. In fact, they all loved it. "All of our work, the effort to get Paramount, the Mayor, and redevelopment committee aligned, everything had come to this moment. We were ready to go. Money in place, land provided by the city, license for the property negotiated with Paramount licensing – all set. If Mr. Jaffe says “yes” and we are a “go” project. And the city wanted to have a press conference within a week announcing the project. And with that, Mr. Jaffe in a single moment, destroyed about five months of work by a host of people, and killed one of the greatest ideas of all time. Stanley waltzed out of the room and I think everyone was stunned. No one could believe it. But our dream pretty much ended there. Sherry Lansing was stunned and apologized to the room and followed her boss out. The Paramount licensing team was embarrassed to say the least, and of course, they were also realizing they had just lost out on millions of dollars in future licensing revenues too. The Mayor and the redevelopment committee were just depressed I think. But they thanked me for all the efforts I put into it, and for making the meetings with Paramount possible, and then they headed back to Las Vegas." In the end the redevelopment bid went to "The Fremont Experience", a mall with concert stages and a barrel shaped roof. Nice, but lacking the imagination that the Goddard Group had put forward. Such a shame, I know I would've definitely visited a full size USS Enterprise, and Vegas has never really appealed to me so it would be doing its job - attracting new visitors. Can't say I'd go out of my way for a nice looking mall though, would you?